(Solaris was released in 1972. Criterion recently re-issued it on DVD and Blu-ray ). So enigmatic and symbolically rich is Solaris that its very title has become a loaded word, a synonym for grief and sorrow. Andrei Tarkovsky’s sci-fi epic is deeply psychological—partly in response to what he perceived as the inhumanity of 2001, which he abhorred—dealing as it does with the idea of our own projections both summoning and destroying something not entirely of our world. The film is, at various points, hallucinatory, serene, and inscrutable; sometimes it’s all three at once. 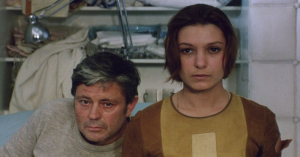 Solaris is so vast, so multifaceted, that it’s impossible to pigeonhole it as any one thing, but were one to attempt to distill its latent meaning somewhat, Tarkovsky’s evocation of grief as a means of understanding oneself would serve as a reasonable launchpad. When you’re as adrift in the depths of your own subconscious as Kris Kelvin is, it makes precious little difference whether you’re firmly planted on terra firma or orbiting the film’s titular ocean planet. Kris is haunted by the memory of his dead wife Hari, and his vain attempt to hold onto her through space, time, and mortality epitomizes the tendency of the living to perpetually return to the dead—and not, as we might like to think, the other way around. Hari is the physical manifestation of Kris’s post-mortem, rose-tinted conception of her, and joins him and two other scientists as a “guest” aboard the unnamed space station courtesy of Solaris itself. She’s oblivious to the fact that she’s a resurrected simulacra but she isn’t impervious to pain. Her inexplicable, impossible-to-believe appearance is the film’s most explicitly strange occurrence, but it’s far from alone: Solaris is replete with oddity. Through long monologues and no lack of literary and artistic allusions, it touches on such subjects as sanity, the conscious and subconscious mind, and regret and remorse—heady, indeed. Each cerebral precept is matched if not outweighed by frequent lapses of the devastatingly visceral kind. The many unanswerable questions the film raises—most of them related to Solaris itself, especially its true nature and what lies beneath the ever-shifting surface of which we’re offered mere appetite-whetting glimpses—serve to provoke further curiosity and inquiry rather than frustration, linked as they are to Kris’s own inner being. We don’t know the planet’s own secrets and desires (or even if it has any) because Kris doesn’t; Kris doesn’t know them because no one does. It’s sometimes said that we know less about the ocean than we do about space. How, then, can even fictional cosmonauts be expected to know anything more about a semi-sentient ocean planet than what it allows them to? Solaris is a trifold mystery drawing much of its power from the puzzles of space, the sea, and human consciousness. All are linked, all are ultimately unknowable. (It may come across as a cop-out to suggest that the silence of Tarkovsky’s film is more revealing than explicit answers ever could be, but there you have it.) “We don’t want any more worlds, only a mirror to see our own,” says one of Kris’s comrades on the space station, and that’s exactly what Solaris is: a mirror of the self. When confronted by his own lack of intellect and understanding—of the cosmos, of the infinite, of Solaris—Kris reacts by turning that mirror further inward than ever before in an attempt to better understand himself. But there are voids within just as there are black holes in the outermost reaches of space, and one is is just as frightening in its unknowability as the other. There’s little distinction between micro and macro in Solaris, but one certainly follows from the other. Kris finds many things on the space station hovering above Solaris, many of them as troubling as his dead wife: the corpse of a friend being preserved in a freezer, wanderers who aren’t actually there, and, most of all, empty space and silence. Snaut and Sartorius, the two men with whom he’s forced to coexist on the station, may be charitably described as unhelpful; harbingers of what might befall Kris’s own psyche should he extend his stay, they’re at least better off than Gibarian, the above-mentioned corpse. Sanity is a matter of majority opinion aboard this ship, and Kris tends to be outvoted by his two uneasy comrades. Unsurprisingly, no one speaks to one another in a meaningful way. This breakdown and failure of communication is one of Tarkovsky’s overarching concerns. Whether between fellow humans or humans and “guests,” speech in Solaris is rare and often one-sided: Kris’s first instinct upon discovering the resurrected Hari isn’t to learn who she is or where she came from but rather to blast her into space, and he interacts with Snaut and Sartorius so rarely that they might as well not even be there. The film is, for all intents and purposes, a one-man show, and the enigmatic planet it revolves around exists mainly to make this point. If 2001 is about the past, present, and future of Man, then Solaris is about the inability of one single man to connect with anyone else or even himself. Kris’s regrets don’t end with Hari, nor are they ever truly resolved. Before departing for Solaris it occurs to him that his father (with whom he rarely speaks) will be dead by the time he returns, a realization that weighs just as heavily on his conscience as does the death of his wife years before. That the result of his grief-laden trip isn’t a catharsis but rather the re-opening of old wounds which continue to haunt him has less to do with Solaris and more to do with Kris. The ocean planet may provide the canvas, but what its visitors do with it is entirely up to them, and Tarkovsky is far more interested in human nature than exploring the mysteries of a distant planet. With the foggy veil of that planet lifted, Kris finds a sort of home among the lost. It’s a state from which he never strayed far and from which he’s unlikely ever to return.